Note: If you view this in full screen (right button under video) you will notice the triangular formation. 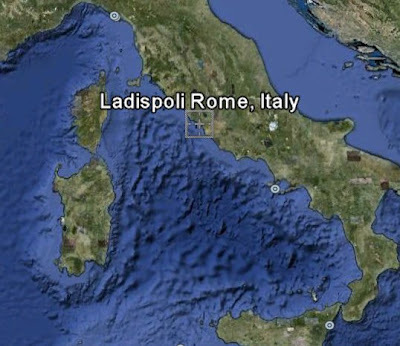 And here is the last of a series of videos showing objects flying over Ladispoli (36 km from Rome, Italy). This solitary object seems to be following a formation of 5, then 3 other similar objects, that on Aug. 8, 2011 flew over our heads. This is the fourth in a series of sightings in just over two months. The first sighting was quite unusual, since the object flew southwest towards Fiumicino (Rome's International Airport) and suddenly it came to a stop and began a vertical descent, disappearing behind a building a few moments later. Since these sightings are becoming quite frequent, I'll try to get a hold of a telescope with a camera port, so I can try and capture images that are a bit more than just a distant faded dot of light. i'm italian, i can understand what he is talking about... his reactions sound genuine to me.